The Aesthetics Committee works to improve the aesthetics of our facility. They provide flower arrangements and décor for Sunday services and for special Sundays like gathering of the waters, day of the dead, flower communion, Christmas, etc. The goal is to provide décor that coordinates with the sermon. They make sure that the décor of the buildings, interior as well as exterior—paint color, rugs, furniture, wall art, etc.—is consistent throughout buildings. They also work with the Building and Grounds Committee to design the landscaping of the exterior spaces around the Dome and Davis buildings. Contact: Krista Tenney, 206-367-8688, tenney@earthlink.net or Peggy Scott Williams, 206-331-2729, pegwilliams3@aol.com for more information. We meet the first and third Fridays at SUUC, 12-2 p.m. Join us for lunch and conversation. There is usually a specific topic of discussion to encourage each participant to share thoughts and feelings about what we especially appreciate in our daily lives. Contact Jerald Forster, 206-523-2931, j_forster@comcast.net for more information. SUUC AV team volunteers install, operate, and maintain multiple systems and technologies in support of a range of activities including all church services, musical and dramatic presentations, special events, and other church productions. Systems and technologies used routinely include sound reinforcement, projection of slides, display of streaming content, videographic recordings of services, computers, projectors, sounds system, video recording equipment. The SUUC AV team is currently has six members and is seeking two (or more) additional regular volunteers to join the rotation and the fun. Interested persons should contact Eric Scott: eric.david.scott@outlook.com for more information. Meets first Wednesdays, 7-8:30 p.m. Contact Bob Beekman, 206-527-7340 for more information. Selections are published in the Soundings monthly newsletter. We are a group of around 20 folks in the church who like to play bridge in a relaxed, social environment. We play twice a month, or more in Threadgill Hall. Come join us. Contact: Juel Erickson: 206- 849-5177, juelerickson@hotmail.com for more information. We take care of the buildings at SUUC. Contact: Bruce Hunt: 503-816-5574, bh7726@comcast.net for more information. Chalice Circles are a form of small group ministry. They promote close relationships via meetings usually once a month, usually in homes. There are lessons prepared by Kate as well as others online from which to choose. These facilitated small groups of members and friends share thoughts on the big questions. Time together is structured. Participants have an opportunity to share and reflect on readings. Usually members commit to attend for a year or more. For more information contact Karen Thompson 206-619-2679. karenmariet61@gmail.com for more information. Provides music for Sunday services twice a month and special music for holidays and other occasions. The rehearsals are often as rewarding as the performances! Thursdays, 6-7:30 p.m. Contact Wil Sederholm, wilholm@msn.com, Choir Director. The Committee on Ministry (COM) is composed of six members who serve staggered three-year terms. Members are appointed by the Board of Trustees in consultation with the minister. An essential function is to serve as a sounding board for the minister. The COM also assesses the various areas of ministry to help those involved move forward and thrive. Contact: Roseann London 206-683-1937, londonroseann@gmail.com for more information. ​Sponsored by the Shoreline Mental Health Ministry. This group is for those whose lives have been touched by mental health issues. Fourth Mondays, 6:30-8:30 p.m. Contact Barbara C., 206-367-9485 or uubcornell@gmail.com. This committee plans Fun(d)raising events that support the church’s operating fund. These are held throughout the year. Events include a Spring Services and Events Auction. Contact Kate Beck., 206-898-7100) or kjbeck@gmail.com for more information. Come play board games and other delightful games on Thursday nights, 6:30-8:30 in the Emerson Room. Contact: Jerome Lutge 206-898-2050, jrlutge@gmail.com for more information. Pagans of various paths come together to share our Earth-based spirituality in a UU context. GreenSong is a chapter of the Covenant of Unitarian Universalist Pagans (CUUPS). The group meets informally on 4th Sundays in the Conference Room after the service and gathers in circle at the solar holidays. Contact Dana Doerksen at greensongcuups@gmail.com for more information. Each Sunday two volunteers greet everyone as they arrive. They encourage visitors to fill out a form which allows us to do follow up calls. This is a wonderful way to serve the church and to get to know people who attend. Contact Cheryl Udd. 206-841-6537, swtchery10@gmail.com for more information. We take care of the grounds around the buildings. Contact Laura Westbrook, 206-605-2005, wildweeder@gmail.com for more information. 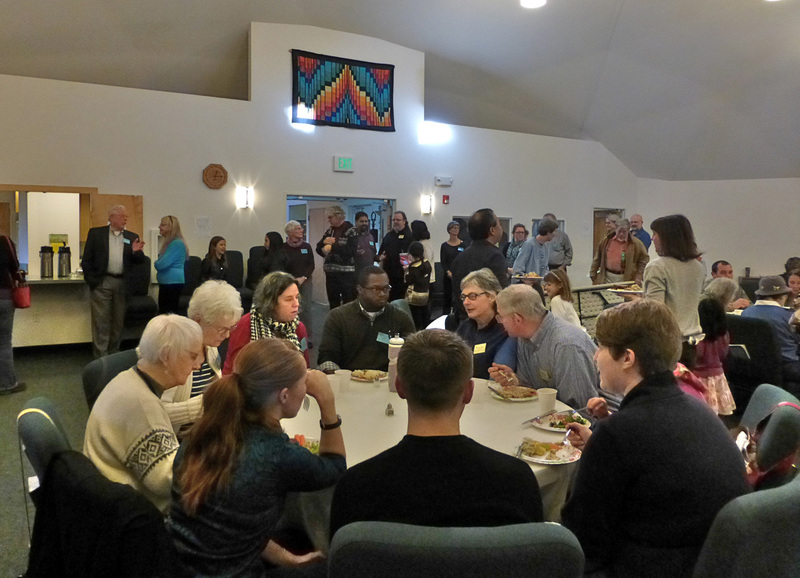 The Mental Health and Recovery Team at Shoreline UU Church offers a ministry of presence, support and education to our congregation and the community. It is believed that mental health or addiction issues impact 1 out of every 4 or 5 families in the U.S. That means practically every family is struggling on some level with these issues. With our newsletter column Side by Side we try to lift the stigma that exists on these issues because stigma prevents people from seeking treatment and support. We are available to consult with people who are looking for a compassionate listener and/or local and national resources. We offer a support group on the fourth Monday evening of every month (at 6:30 PM in the Conference Room) for Friends and Family of people with a lived experience of mental illness. Join us today to learn more! Contact: Barbara Cornell 206-510-5690 uubcornell@gmail.com for more information. Music permeates the life of our congregation, from the smallest children singing Spirit of Life to our choir sharing a South African protest song to all of us raising our voices together during the Sunday service. The Music Committee encourages congregants to share their musical gifts and creates a culture of musical abundance for all ages and abilities. Join the Committee on the first Thursday of each month at 8 p.m. The choir rehearses at 6:30 p.m. on Thursdays and provides music for Sunday services twice a month and special music for holidays and other occasions. 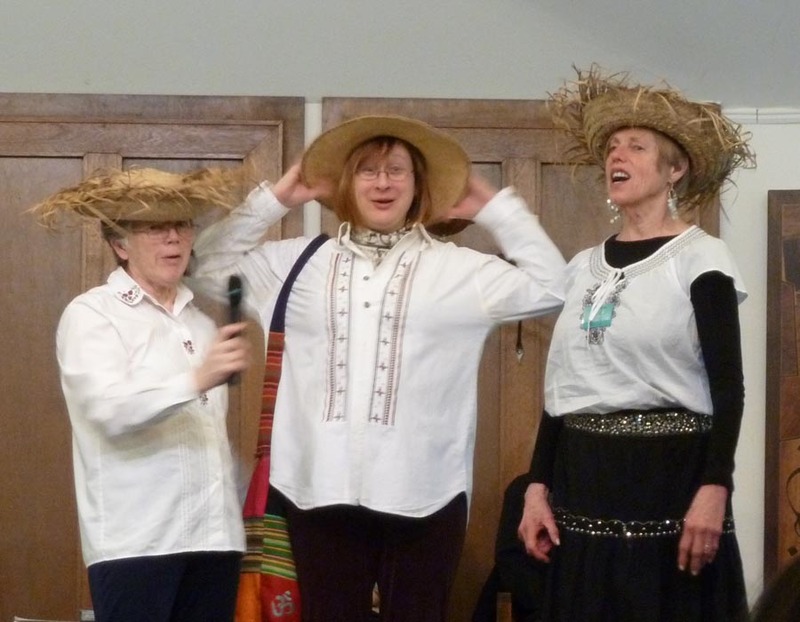 Chancel musicians in our congregation provide music on other Sundays. 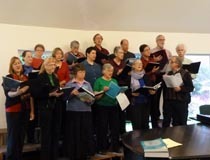 A cantor leads congregational singing every Sunday. Contact Carolyn Wallace, chair, 206-782-6898 or c.maurinewallace@comcast.net for more information. We hold potluck dinners at the church on 1st and 3rd Tuesdays in the Davis Building. Contact: Marilyn Grevstad: 206-364-6288, grevstad@aol.com for more information. The Readers’ Theater Group is for anyone interested in drama of all kinds. We put on (and sometimes create) chancel plays in place of the sermon in an occasional service. We put on mystery dinners, and hold armchair theater evenings, where we read full length plays. We have sponsored an improv class. Pretty much anything you can think of in dramatic arts, we’re willing to undertake. Come join us, and we’ll have some fun. Contact: Homer Henderson: 206-941-9866, the_hendersons2000@yahoo.com for more information. The Director of Religious Exploration is Chris Pollina. While he plans the curriculum, this program is totally dependent on the members and friends of the church who serve as teachers. This program has grown tremendously in the last few years, now serving about 80 children and youth with 50 on Sunday morning. Contact Chris Pollina, Director of Religious Exploration, 206-240-5500, shorelinedre@gmail.com for more information. Building rentals help support SUUC financially while promoting our mission and giving us visibility to the wider community. The Rental Committee helps the Administrator, when needed, in the implementation of space rentals. We have a clear rental policy and rate sheet to guide us, both of which we re-evaluate annually. We also discuss ways to promote our space availability. Members of the Rental Committee can carry out most decision-making by phone, but we also meet several times a year. Contact Rick Wilson at 206-799-3054, rickwilson7863@msn.com for more information. Attend a weekend of relaxation, fellowship, programs and fun for all ages held at Seabeck Conference Center on Hood Canal, usually the held end of April or early May. View SUUC Seabeck video here: http://www.youtube.com/watch?v=EeYk3eCLMzY. Contact: Renee at seabeckregistrar@gmail.com. Sno-King Meaningful Movies is sponsored by our Social Action Ministry (SAM). We show social justice documentaries with community discussion to inform and engage the community on a wide range of topics that affect our lives and community. Our movies are free and open to the public, on the second Saturday of every other month. SUUC members of this team are Bill King, Mike Marvel, Deva Powell, and Krista Tenney. We are looking for more volunteers. Come join us. Screening location: Edmonds Unitarian Universalist Congregation, 8109 224th St. SW, Edmonds, WA 98026. Contact Bill King 425-582-8762 or bking@western.edu. SAM assists the congregation to express our UU values by identifying, developing and communicating opportunities to assist those in need by direct action, or to influence public policy in order to create a more just world. We usually meet in Threadgill Hall at 9:30 on second Saturdays. For more information on getting involved, please visit their blog at http://www.nwuujn.org/topics/view/5548de810cf2ab913fd7e70b/. Contact Krista Tenney 206-367-8688, tenney@earthlink.net. Every fall the Stewardship Drive conducts a pledge drive for the upcoming SUUC fiscal year. Members on the committee reach out to the SUUC community to educate them about the importance of each and every pledge. Sounds serious? It is, but this group makes it fun! Come by and get to know them! Contact Ryan Dunne rhinodunne@gmail.com or Paul Borrmann kdonn55@comcast.net 206-257-4124. The Sunshine Singers are a group of Shoreline folks who sing at the memory care unit in Ida Culver Broadview on Greenwood at N 127th Street. We sing old songs like “You Are My Sunshine” and “When the Saints Go Marching In”, ones that the residents will remember. We welcome other singers and instrumentalists to join us on the 1st, 3rd and 5th Fridays from 4:30 to 5:30. Singers include Susan Storer Clark, Jo Moore, Ken Ritland (fiddle), Laura Banks, Deva Powell, Joe Knight, Paul Borrmann, Carolyn Wallace, and Darrell Udd. You can join us in this enjoyable way to bring joy into the life of others. Contact: Bill King, 425.582.8762, bking@western.edu. Ushers have a variety of duties preparing for the worship service as well as handing out bulletins as people arrive. This is one of the many essential services which volunteers provide which makes our morning worship happen. Everyone is invited to participate in this service. Contact Homer H., 206-364-2900 or the_hendersons2000@yahoo.com, for information. We help guide the ushers, greeters, and baristas to help make your Sunday morning experience a welcoming one. We also sponsor our Thanksgiving dinner, offer orientation classes, and welcome new members with the in-gatherings. Would you like to be a part of the group that helps make SUUC a welcoming place? Join us! We meet the second Wednesday of each month from 7 until about 8 p.m. and would love to have you share your ideas. Contact: Rick Wilson rickwilson7863@msn.com or 206-799-4054. The monthly SUUC Women's Circle meets on the first Saturday morning of each month, in the Threadgill Hall of the Davis Building, from 9:30 a.m. to noon. Our Women’s Circle is open to both members and non-members, and to everyone who self-identifies as female. Our discussions are confidential, and notes are not taken. Our goal is getting to know each other, and with that in mind, we’ve discussed a wide range of topics over shared snacks and coffee. Our format this year has been to open the circle with a check-in, break into small groups for discussion, have a snack break, then reconvene either in smaller groups or back in the larger group, for closing and announcements. The meeting format is really up to the presenter(s), with the conveners assisting on timekeeping, check-in and announcements. Each month, there is a different topic/activity, led or presented by members of the group, who sign up to lead the group. Snacks are an option, but not required. Setting up and cleaning up by members is another way for us to get to know each other. Contact: Deva Powell devaroo@gmail.com, Marguerite Chin divaroy@comcast.com, or Nancy Curtis nancycurtis7@comcast.net. For more information about any church committees or programs, contact the church office at 206-363-7994, office@shorelineuu.org. Also consider subscribing to the weekly SUUC eBulletin, our free church community email. Email office@shorelineuu.org.